Charmouth is surrounded by great walking country with an abundance of public footpaths and National Trust land. Whether you prefer gentle level strolls or more demanding hilly stomps you will find walks with fantastic views through unspoiled countryside. Here is a quick glimpse of some of the walks with links to more information. Click the photographs to view larger. At 630 miles the South West Coast Path is Britain’s longest path stretching from Minehead to Poole Harbour. Read more on the official website www.southwestcoastpath.com. The coast path immediately to the east and west of Charmouth is currently diverted due to landslides but there are clear signs with maps to show the alternative routes via the road to Lyme and the lane to Stonebarrow Hill. You might be tempted to ignore the signs but are reminded that the cliff edge is extremely unstable and that behind it is private land. The Golden Cap Estate has over 25 miles of paths through unspoiled farmland, woods and along the cliff top. There are stunning views of the coastline from the top of Stonebarrow Hill and Golden Cap. There is a good, fairly strenuous walk along the coast path, over Stonebarrow Hill and Golden Cap, to Seatown or further to West Bay. The walk is well described on the Explore the South West Coast Path website and you can find out more about the Golden Cap Estate on the National Trust website. Stretching west from Lyme Regis to Axmouth The Undercliff is a National Nature Reserve and is one of the most important wildernesses in Britain and an internationally important mix of habitats from dense scrub and woodland to open ground, with many special plants and animals. The whole reserve is formed from landslides which still occur today. English Nature manage the reserve and visitors are required to keep to the South West Coast Path than runs through it. The path from Lyme to Axmouth is about 8 miles and is varied in difficulty, some stretches are level and easy but there are also many unavoidable steep sections with rudimentary steps and exposed tree roots, it can also get very muddy. There is a nice footpath walk from Charmouth to Wootton Fitzpaine along a tributary of the River Char and across meadows. The footpath starts in the centre of the village next to the Post Office and it’s about a mile and half to Wootton. Another footpath follows the River Char to Whitchurch Canonicorum about two miles away. The footpath starts on the right (east), just over the bypass bridge on the lane to Wootton Fitzpaine. Whilst in Whitchurch it is worth popping into the church of St.Candida & Holy Cross, ‘The Cathedral of the Vale’. The church is over a thousand years old and contains the shrine of St.Whit (St.Candida), one of only two shrines in Britain to survive the reformation. The lower part of the stone tomb has oval openings into which pilgrims would place their diseased limbs or items of clothing to be blessed. Read more about the ‘The Cathedral of the Vale’ on the church website. More ambitious walkers can extend the first of the river walks above to include Coney’s and Lambert’s Castles about a mile and a mile and a half respectively to the north from Wooton Fitzpaine. These are iron age hillforts and both offer, especially Lambert’s, spectacular views over the Marshwood Vale. See the Wikipedia articles on Lambert’s and Coney’s castles. See more photographs of Lamberts Castle and Coney’s Castle on the Modern Antiquarian website. The other river walk can be extended to form a circular walk including Stonebarrow Hill or even Golden Cap. The return route to Charmouth village is currently down Stonebarrow Lane because the coast path is closed due to a landslip. Read more about Stonebarrow and Golden Cap on the National Trust website. 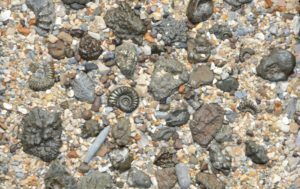 If you have enjoyed a walk in the Charmouth area please tell us about it and we will add it to this page.